Directorate of Research, Krishna Institute of Medical Sciences Deemed University, Malkapur, Karad, Maharashtra, India. Gardenia jasminoides, the genus of Gardenia, a Chinese medicinal plant, which belongs to the family Rubiaceae is herb used since ancient times. It is also known as Fructus Gardeniae and Gardenia augusta as different synonyms, well known as Anant in Marathi language, Gandharaj in Hindi language and Zhi Zi in Chinese language. Gardenia jasminoides extracts and its main active phytoconstituents geniposide, genipin, crocin, crocetin have been reported for a wide range of pharmacological activities such as anti-hyperglycemic, anti--atherosclerotic, anti-inflammatory, anti-arthritis, anti-cancer, anti--apoptotic, anti-oxidant, anti-angiogenic, anti-thrombotic, anti-microbial and miscellaneous activities. Also it has been explored its protective effect through diverse mechanisms like neuroprotective for Alzheimer’s disease, hepatoprotective, gastro-protective, retino-protective, nephro-protective, skin protective activities. This review will give new insights of Gardenia jasminoides relating to the ethnopharmacology, phytochemistry and pharmacological uses. 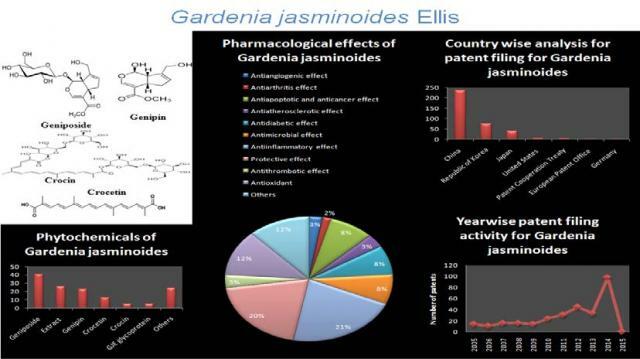 This data will also highlight the patenting trends and different assignees involved in filing patents for Gardenia jasminoides. Phatak RS. Phytochemistry, Pharmacological Activities and Intellectual Property Landscape of Gardenia jasminoides Ellis: a Review. Pharmacognosy Journal. 2015;7(5):254-265.